Like a medium-sized dog in appearance. Nose more pointed and tail bushier than most dogs. Larger than the Red Fox and much smaller than Gray Wolf. Tail held down between legs when running. Long, dense fur. Pelt gray or reddish-gray, with rusty legs, feet, and ears. Throat and belly whitish. Measurements from Foresman (2012): Total Length averages 44.5 inches in females and 48 inches in males; Tail Length averages 14 inches in females and 13.7 inches in males; Weight averages 22.0 pounds in females and 28.4 pounds in males. Gray Wolf - larger, hold tail high when running. Red Fox - smaller, hold tail out straight when running. Domestic Dog/Coyote, Gray Wolf/Coyote, Gray Wolf/Domestic Dog crosses are also possible. Utilizes almost any habitat, including urban areas, where prey is readily available. Prefers prairies, open woodlands, brushy or boulder-strewn areas. Coyote abundance is tied to food availability. Mainly nocturnal, true scavenger, territorial. Kills large animals by attacking the throat. Adaptable. Occupies diverse habitats. Consumes a variety of foods and carrion. Will eat almost anything, plant or animal. Emphasizes small mammals, fawns, plants, birds, and invertebrates. During winter, often preys on adult deer. Commonly preys on domestic sheep. Rodents and rabbits important year-round. Grasshoppers, crickets, fruits may be used in summer and fall. Food habits vary between seasons and areas. Young deer, elk, and pronghorn in spring. In absence of alternative prey, preys on adult deer in winter and fawns in summer. May be severe. Alternative prey population dynamics deserve consideration prior to Coyote control. Coyotes do kill sheep. Mated pairs usually produce pups each year, and both adults assist in care of the young. Den used for rearing pups. Breeds from January to March; 60 to 63 days gestation; four to seven pups in a typical litter. 44% female yearlings produce young. 63% of all females produce young. Productivity related to nutrition. Average 4.6 young per litter. Probably breeds between January and March. Bekoff, M. 1977. 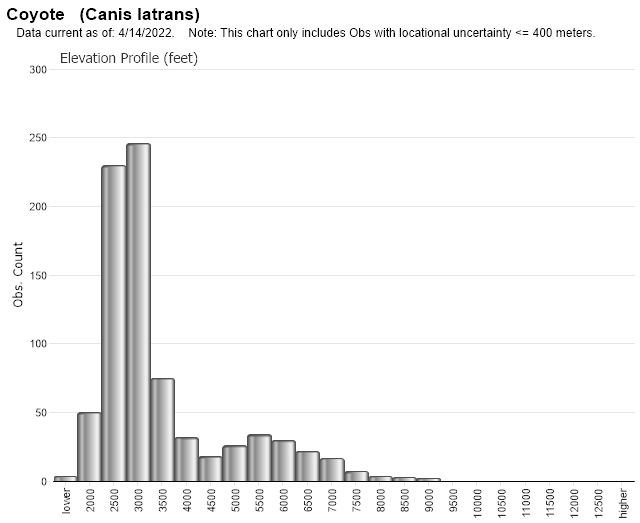 Canis latrans. Mamm. Species No. 79. 9 pp. Bekoff, M., editor. 1978. Coyotes: biology, behavior and management. Academic Press, New York. 384 pp. Boyd, D. 1982. Coyote-wolf interactions with regard to food habits and movements in the North Fork Flathead drainage. M.S. thesis, University of Montana, Missoula. 115 pp. Casebeer, R. L., M. J. Rognrud and S. M. Brandberg. 1950. Rocky Mountain goats in Montana. Montana Fish and Game Comm., Wildl. Rest. Div. Bull. No.5. 107 pp. Clark, F.W. 1972. Influence of jackrabbit density on coyote population changes. J. Wild. Manage. 36(2):343-356. Corneli, P. S. 1980. Pronghorn fawn mortality following coyote control on the National Bison Range. M.S. thesis. University of Montana, Missoula. 69 pp. Cottrell, L. 1928. Elk and coyotes. Yellowstone Nature Notes. 5(2). Cross, James, and Richard P. Weckwerth, 1978, Upland Game Bird (and Fur Survey) Inventory. Wildlife Investigations, Region One. W-130- R-9, Job No. II-1, July 1, 1977 - June 30, 1978. Cross, James, and Richard P. Weckwerth, 1980, Upland Game Bird (and Fur Survey) Inventory. Wildlife Investigations, Region One. W-130- R-11, Job No. II-1, July 1, 1979 - June 30, 1980. Cross, James, and Richard P. Weckwerth, 1981, Upland Game Bird (and Fur Survey) Inventory. Wildlife Investigations, Region One. W-130- R-12, Job No. II-1, July 1, 1980 - June 30, 1981. Cross, James, and Richard P. Weckwerth, 1982, Upland Game Bird (and Fur Survey) Inventory. Wildlife Investigations, Region One. W-130- R-13, Job No. II-1, July 1, 1981 - June 30, 1982. Cross, James, and Richard P. Weckwerth, 1983, Upland Game Bird (and Fur Survey) Inventory. Wildlife Investigations, Region One. W-130- R-14, Job No. II-1, July 1, 1982 - June 30, 1983. Dood, A. R. 1978. Summer movements, habitat use, and mortality of mule deer fawns in the Missouri River Breaks, Montana. State of MT, Proj. No. W-120-R-8, 9. Econ Incorporated. 1973-1975. The habitat diversity and utilization analysis of the major wildlife species on a portion of the Colstrip 10x20 area. Ecological Consulting Service Division, Helena. Erickson, Glenn, 1977, Fur Survey and Inventory. Statewide Wildlife Survey and Inventory. W-130-R-7, II-4, July 1, 1975 - June 30, 1976. Gier, H.T. 1975. Ecology and behavior of the coyote (Canis latrans). Pages 247-262 in M. W. Fox (ed). The wild canids: their systematics, behavioral ecology and evolution. Van Nostrand Reinhold Co., New York, NY. xvi + 508 pp. Hamlin, K. L. 1979. Cooperation by coyote pairs attacking mule deer fawns. Jour. Mammal. 60(4):849-850. Henderson, R. E. 1977. A winter study of coyote predation on white-tailed deer in the Miller Creek Drainage, Montana. M.S. thesis. University of Montana, Missoula. 50 pp. Henke, S. E. and F. C. Bryant. 1992. Changes in rodent community ecology due to intensive coyote control on a semiarid, short-grass prairie. Abstract, 6th Annual Meeting of the Society for Conservation Biology, 72 pp. Humphris, Michael., 1991, Wildlife Monitoring Report. Spring Creek Coal Company 1991 Mining Annual Report. Appendix I. April 11, 1991. Knapp, S. J. 1977. Birney-Decker wildlife study. Montana Dept. Fish and Game and BLM. Land & Water Consulting, Inc., Missoula, MT., 2002, Montana Dept. of Transportation Wetland Mitigation Monitoring Report, Year 2001: Batavai, Kalispell, Montana. Proj. No. 130091.006. July 2002. In 2001 Wetland Mitigation Monitoring Reports, Vol. I. Land & Water Consulting, Inc., Missoula, MT., 2002, Montana Dept. of Transportation Wetland Mitigation Monitoring Report, Year 2001: Browns Gulch, Rocker, Montana. Proj. No. 130091.012. July 2002. In 2001 Wetland Mitigation Monitoring Reports, Vol. I. Land & Water Consulting, Inc., Missoula, MT., 2002, Montana Dept. of Transportation Wetland Mitigation Monitoring Report, Year 2002: Batavia, Kalispell, Montana. Proj. No. 130091.006. February 2003. In 2002 Wetland Mitigation Monitoring Reports, Vol. I. Land & Water Consulting, Inc., Missoula, MT., 2002, Montana Dept. of Transportation Wetland Mitigation Monitoring Report, Year 2002: Browns Gulch, Rocker, Montana. Proj. No. 130091.012. February 2003. In 2002 Wetland Mitigation Monitoring Reports, Vol. I. Land & Water Consulting, Inc., Missoula, MT., 2002, Montana Dept. of Transportation Wetland Mitigation Monitoring Report, Year 2002: Camp Creek, Sula, Montana. Proj. No. 130091.039. February 2003. In 2002 Wetland Mitigation Monitoring Reports, Vol. I. Land & Water Consulting, Inc., Missoula, MT., 2002, Montana Dept. of Transportation Wetland Mitigation Monitoring Report, Year 2002: Creston Site, Creston, Montana. Proj. No. 130091.007. February 2003. In 2002 Wetland Mitigation Monitoring Reports, Vol. I. Land & Water Consulting, Inc., Missoula, MT., 2002, Montana Dept. of Transportation Wetland Mitigation Monitoring Report, Year 2002: Hoskins Landing, Dixon, Montana. Proj. No. 130091.038. February 2003. In 2002 Wetland Mitigation Monitoring Reports, Vol. I. Land & Water Consulting, Inc., Missoula, MT., 2002, Montana Dept. of Transportation Wetland Mitigation Monitoring Report, Year 2002: Musgrave Lake, Zurich, Montana. Proj. No. 130091.019. May 2003. In 2002 Wetland Mitigation Monitoring Reports, Vol. II. Land & Water Consulting, Inc., Missoula, MT., 2002, Montana Dept. of Transportation Wetland Mitigation Monitoring Report, Year 2002: Peterson Ranch, Hall, Montana. Proj. No. 130091.010. February 2003. In 2002 Wetland Mitigation Monitoring Reports, Vol. II. McCann, Steve A. 1976. Nongame mammals of Musselshell County, Montana with special reference to the effects of reclamation. MT Dept of Fish and Game. 57 pgs. Mills, L. S. and F. F. Knowlton. 1991. Coyote space use in relation to prey abundance. Can. J. Zool. 69: 1831-1836. Montana Dept. of State Lands, 1976, Draft environmental impact statement for proposed open cut mining contract for Amercan Colloid Company. November 12, 1976. Montana Outfitters & Guides Association. Montana Fish, Wildlife & Parks., 2000, Predator management in Montana. Symposium proceedings, January 8, 2000. Montana Prairie Dog Working Group. 2002. Conservation plan for black-tailed and white-tailed prairie dogs in Montana. Montana Fish, Wildlife and Parks. Helena MT. 51 pp. Montana Tunnels Mine, Inc., Jefferson City, Helena, MT., 1988?, Application for an Amendment to the Montana Tunnels Operating Permit for the Prickly Pear Water Supply System, Jefferson County, Montana. Murie, A. 1940. Ecology of the coyote in Yellowstone. US Nat. Park Serv. Fauna Ser. No. 4. 206 pp. Murie, O. J. 1945. Notes on coyote food habits in Montana and British Columbia. J. Mammal. 26:33-40. Nelson, E. H. 1972. An analysis of coyote calling as a game management technique. M.S. thesis. University of Montana, Missoula. 69 pp. Pattie, D.L. and N.A. M. Verbeek. 1967. Alpine mammals of the Beartooth Plateau. Northwest Science 41(3): 110-117. Peabody Coal Company, Flagstaff, AZ., 1991, Wildlife monitoring report: 1990 field season, Big Sky Mine. July 1991. Powder River Eagle Studies, Gillette, WY., 1992, Big Sky Mine 1991 wildlife monitoring studies. Rev. February 1992. Powder River Eagle Studies, Inc., Gillette, WY., 1996, 1995 wildlife monitoring report: Big Sky Mine. March 1996. Pyrah, D. 1984. Social distribution and population estimates of coyotes in north-central Montana. J. Wildl. Manage. 48(3):670-690. Reichel, J. D. 1976. Coyote-prey relationships on the National Bison Range. M.S. thesis. University of Montana, Missoula. 86 pp. plus appendices. Reichel, J.D. 1986. Habitat use by alpine mammals in the Pacific Northwest. Arctic and Alpine Research. 18(1): 111-119. Robinson, W. 1952. Some observations on coyote predation in Yellowstone National Park. J. Mammal. 33:470-476. Robinson, W. B. and E. F. Grand. 1968. Comparative movements of bobcats and coyotes as disclosed by tagging. J. Wild. Mgmt. 22(2):117-122. Robinson, W. B. and M. W. Cummings. 19??. Movements of coyotes from and to Yellowstone National Park. U.S. Dept. Int., Spec. Sci. Rept. Wild. No. 11. Sargeant, A. B., S. H. Allen and J. O. Hastings. 1987. Spatial relations between sympatric coyotes and red foxes in North Dakota. J. Wildl. Manag. 51(2):285-293. Schladweiler, P. 1980. Coyote densities, small mammal population indices, and big game fawn production and survival in the various study areas. State of Montana Wildlife Research, Proj. No. W-120-R-11. 78 pp. Schladweiler, P. 1981. Coyotes and big game. Montana Outdoors 12(2):17. Schladweiler, P., K. L. Hamlin, and D. B. Pyrah. 1984. Coyote food habits, prey availability, and relationships to predation on deer in the Missouri River Breaks, Montana. Paper presented at Third Predator Symposium, Missoula. Stearns-Roger Inc., 1975, Environmental baseline information of the Mount Vernon Region, Montana. January 31, 1975. Thompson, L.S. 1982. 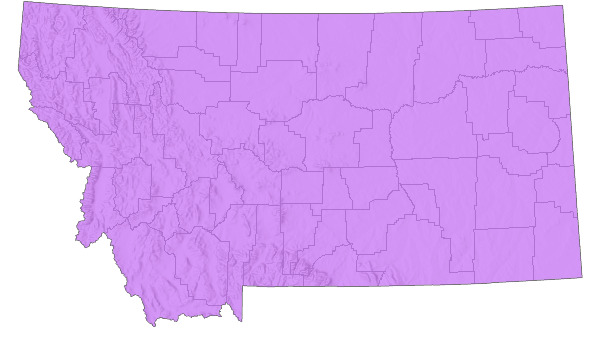 Distribution of Montana amphibians, reptiles, and mammals. Bozeman: Montana Audubon Council. 24 pp. Thunderbird Wildlife Consulting, Inc., Gillette, WY., 2003, 2002 wildlife monitoring report: Big Sky Mine. February 2003. TVX Mineral Hill Mine, Amerikanuak, Inc., Gardiner, MT., 2002, Yearly summary of wildlife observation reports. 1990-2002 Letter reports. U.S. Forest Service, Kootenai National Forest. Montana Dept. of State Lands., 1978?, Final Environmental Impact Statement. Proposed Plan of Mining and Reclamation. Troy Project, Asarco, Inc., Lincoln County, Montana. Vol. III. Waage, B.C. 1986. Western Energy Company Rosebud Mine, Rosebud County, Montana: Annual Wildlife Monitoring Report, 1986 Field Season. December 1986. Waage, B.C. 1987. Western Energy Company Rosebud Mine, Colstrip, Montana: Annual Wildlife Monitoring Report, 1987 Field Season. December 1987. Waage, B.C. 1988. Western Energy Company Rosebud Mine, Colstrip, Montana: Annual Wildlife Monitoring Report, 1988 Field Season. December 1988. Waage, B.C. 1989. Western Energy Company Rosebud Mine, Colstrip, Montana: Annual Wildlife Monitoring Report, 1989 Field Season. December 1989. Waage, Bruce C., 1992, Western Energy Company Rosebud Mine, Colstrip, Montana: Annual Wildlife Monitoring Report, 1991 Field Season. December 1992. Waage, Bruce C., 1997, Western Energy Company Rosebud Mine, Colstrip, Montana: 1996 Annual Wildlife Monitoring Report; December 1, 1995 - November 30, 1996 Survey Period. February 28, 1997. Waage, Bruce C., compiler., 1985, Western Energy Company Rosebud Mine, Rosebud County, Montana: Annual Wildlife Monitoring Report, 1984 Field Season. October 1985. Westech, Inc. [Western Technology and Engineering]. No date. Preliminary wildlife reconnaissance, Ruby and Little Ben mine areas, Little Rocky Mountains, Montana. Technical Report for Zortman and Landusky Mining Companies. Western Energy Co., Colstrip, MT., 1980, Western Energy Company Rosebud Mine, Colstrip, Montana: Annual Wildlife Report, 1980. Western Energy Co., Colstrip, MT., 1982, Western Energy Company Rosebud Mine, Colstrip, Montana: Annual Wildlife Report, 1982. Western Technology and Eng., Inc., 1991, Wildlife resources of the Little Rocky Mountains Environmental Study Area. March 1991. In Application for Amendment to Operating Permit No. 00096, Zortman Mining, Inc., Phillips County, Montana. Vol. 3. Jan. 3, 1995. Western Technology and Engineering, Inc. (WESTECH)., 1990, Wildlife Monitoring: Absaloka Mine Area Annual Report, 1990. 12/21/89-12/20/90. Montana SMP 85005 R1. OSMP Montana 0007B. Febr. 15, 1991. Western Technology and Engineering, Inc. (WESTECH)., 1993, Wildlife Monitoring Asaloka Mine Area Annual Report, 1992. Montana SMP 85005 R1. OSMP Montana 00078. 1993. Westmoreland Resources, Inc., Hardin, MT., 1983, 1980 Wildlife Monitoring Report. 12/21/79-12/20-80. Westmoreland Resources, Inc., Hardin, MT., 1983, 1983 Wildlife Monitoring. Young, S.P. and H.H.T. Jackson. 1951. The clever coyote. Part l: its history, life habits, economic status and control. Part II: classification of the races of the coyote. The Stackpole Co., Harrisburg, PA, and The Wildl. Manage. Inst., Washington, DC. 411 pp. Web Search Engines for Articles on "Coyote"